Opaque lesions on the teeth, which can be white, yellow, or brown and include variations in translucency of the enamel, are qualitative defects characterized by normal thickness and a smooth surface. In general, these lesions are classified as developmental enamel opacity, white spot lesions (WSLs), and dental fluorosis. White lesions of the teeth can develop due to several factors and create esthetic problems for patients. Enamel opacity can be difficult to overcome for both dentists and patients economically and psychologically besides its biological features. WSLs are caused by demineralization of the enamel and are defined as subsurface porosity localized at smooth surface. WSLs are also described as the most important detrimental effect of fixed orthodontic treatments. In recent studies, the incidence of a WSL in at least one tooth of a patient was 46%–73% following fixed orthodontic treatment., Therefore, approaches to prevent or treat WSLs are of high importance, particularly during and after fixed orthodontic treatment. Low-viscosity resins have become a current issue for WSLs because the efficiency of preventive methods to stop and treat initial caries is limited and invasive attempts can cause loss of sound tooth structure., The new treatment approach supports the tissue mechanically and prevents nutritional support by restraining decay-causing microorganisms in the lower layers of the lesion and decreased porosity. Additionally, as the refraction index of the resin used in the infiltration technique is very close to that of enamel, it masks WSLs for a long time, enabling restoration of lost translucency. On the other hand, infiltrating materials can penetrate into demineralized enamel because of their low viscosity and are advantageous in the treatment of developmental hypomineralized enamel defects. However, limited studies are available on this subject. The aim of this study was to evaluate the changes in lesions' structure and masking the opacity of lesions on vestibular surfaces of permanent upper incisors (i) by applying resin infiltrate to developmental enamel opacities and (ii) applying resin infiltrate or fluoride varnish to WSLs caused by fixed orthodontic treatment. A total of 137 teeth from 68 patients (age 8–16 years) who applied to Akdeniz University, Faculty of Dentistry, Department of Pediatric Dentistry, with a complaint of WSLs due to fixed orthodontic treatment and developmental enamel opacities on the vestibular surfaces of permanent upper incisors, were included in the study. The inclusion criteria of the patients are shown in [Table 1]. The ethics council approval required for our study was acquired from Antalya Education and Research Hospital Clinical Studies Ethics Council (14.05.2015-60/6) and approved consent was taken from the parents of the participants. The study groups were formed randomly [Figure 1]. The first group included patients who had developmental enamel opacities on the vestibular surfaces of permanent upper incisors. The second and third groups were patients who were treated with active fixed orthodontic treatment for at least 1 year and had WSLs on their permanent upper incisors. Resin infiltrate was applied to Groups 1 and 2, and fluoride varnish was applied only to Group 3. All patients in the study were given oral hygiene training. Food and beverages that can cause staining of the teeth or acid erosion were described and the patients were recommended not to consume them. All patients in the study were recommended to use toothpaste with 1,500 ppm fluoride and manual toothbrushes, and patients were warned to avoid other fluoride sources during the study such as using fluoridated dental floss and mouth rinse. Teeth were polished and plaque was removed before the procedure. Teeth were isolated and scored according to International Caries Detection and Assessment System (ICDAS) II criteria by visual inspection. A laser fluorescence examination was carried out with DIAGNOdent pen (KaVo Dental Corporation, Biberach, Germany). Measurements were carried out according to the manufacturer's instructions after calibration with a special ceramic piece. After isolating a tooth with a cotton roll and drying the tooth with air spray, the sapphire end of the equipment was vertically placed on the area and three different sections of the lesion surface were measured. The highest level was recorded as the laser fluorescence score. Resin infiltrate that hardens by light curing was applied to patients' teeth in Groups 1 and 2 according to the manufacturer's instructions. After the lips were excluded with a mouth retractor, the gingiva of the relevant teeth was isolated with a gingival barrier. A 15% HCl solution was applied to the lesions on the teeth with a special end for 2 min. Then, the teeth were washed for 30 s and dried with air spray containing no oil or water. Ethanol was applied to the surface of the lesion for 30 s and dried with the same air spray to remove water on the enamel pores. Resin infiltrate was circularly applied to dried surfaces through a special end for 3 min to increase penetration into the pores. After the materials were removed from interproximal areas with dental floss, light polymerization was applied for 40 s. The resin infiltrate was replaced on the teeth for 1 min, and light polymerization was applied. Fluoride varnish was applied to patients' teeth in Group 3. After patients' teeth were isolated with a mouth retractor, a fluoride varnish was applied to the surface of the teeth with a brush. The application was completed by waiting 2–3 min as the material covered all teeth surfaces. The patients were told not to brush their teeth or consume hard and sticky food requiring chewing except liquid and soft food for the next 4 h.
Lesions on the incisors were evaluated in accordance with ICDAS II criteria and DIAGNOdent Pen scores for all three groups before applying the material (T0), just after the application (T1), and after 1 month (T2) and 3 months (T3). All material applications in the study besides DIAGNOdent pen and ICDAS II evaluations were carried out by the same researcher who was blind as to group allocation of the subjects. An intraexaminer reliability test was performed by a re-evaluation of a random sample (10%) of the material. SPSS software (SPSS 18.00 for Windows, Chicago, IL, USA) was used for descriptive statistics, reliability analysis, and comparison tests of the collected data. Student's t-test was used in comparison to quantitative if the parametric conditions are provided. The analysis of variance was used for repeated measurements of the groups and Tukey's HSD multiple comparison test for subgroup comparisons. Kruskal–Wallis, Mann–Whitney U, Wilcoxon, and Chi-square tests were used for examining qualitative data and comparing the groups when the parametric conditions are not provided. The results were evaluated in 95% confidence interval and P < 0.05 significance level. A total of 137 teeth from 68 patients (41 females and 27 males) were included in our study, but two patients in Group 3 were excluded because they did not come to control sessions. Thus, the study was carried out with 66 patients (41 females and 25 males; age 8–16 years). The number of teeth in Groups 1, 2, and 3 was 41, 51, and 40, respectively [Table 2]. Intrarater reliability was evaluated for DIAGNOdent Pen and ICDAS II measurements in prestudy groups, and Kappa values of DIAGNOdent Pen and ICDAS II measurements, were 0.96 and 0.98, respectively. 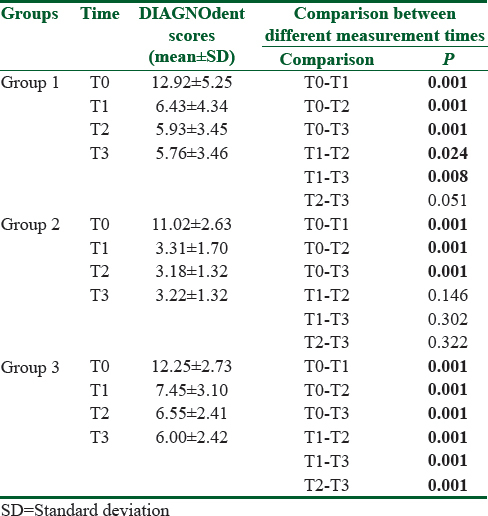 The changes in DIAGNOdent Pen measurements and ICDAS II scores with time are shown in [Figure 2]a and [Figure 2]b.
T0 measurements were not different between the groups according to DIAGNOdent Pen and ICDAS II scores. A significant decrease in DIAGNOdent Pen scores was found observed in the groups. The most important decrease was seen in Group 2 followed by Groups 1 and 3. Although there was a decrease in all groups, the decrease in only Group 2 was not significant when T1, T2, and T3 results were compared. Group 3 decrease was significantly different when T2 and T3 scores were compared [Table 3]. 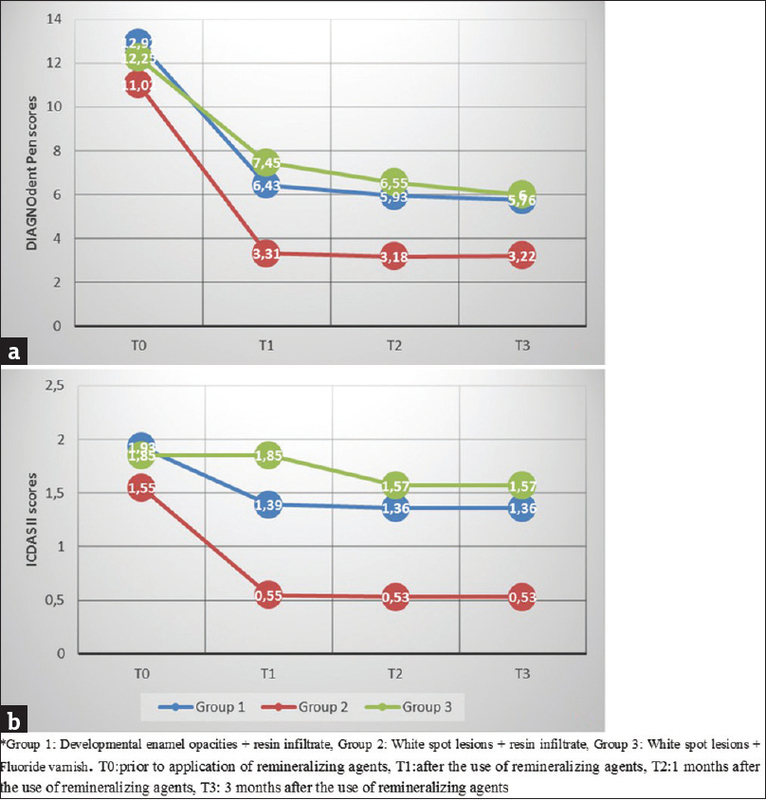 ICDAS II scores were decreased after 3-month follow-up in all groups [Figure 3]. A significant decrease in ICDAS II scores was observed in Groups 1 and 2, which were treated with resin infiltrate. 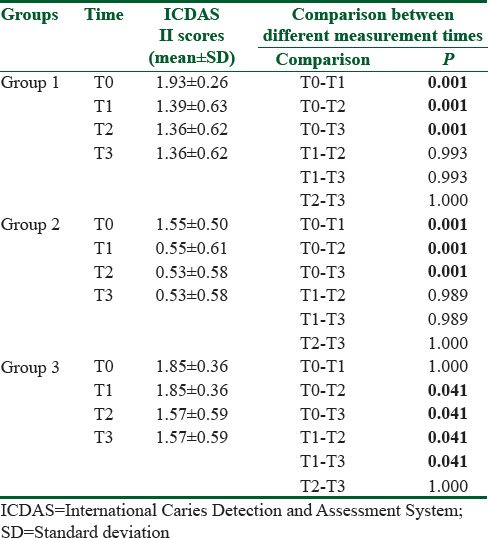 Although T1–T2 ICDAS II scores of these two groups decreased slightly, no significant difference was observed. No visual change was detected between T0 and T1 scores in teeth of Group 3, but a significant decrease between the T1 and T2 scores was observed. None of the scores changed between T2 and T3 [Table 4]. In this randomized and controlled clinical study, changes in lesions were evaluated after applying resin infiltrate to developmental enamel opacities and WSLs as well as a fluoride varnish to WSLs, over 3 months. Hypomineralized and demineralized teeth surfaces were evaluated according to ICDAS II criteria and DIAGNOdent pen measurements, which have a good correlation, after considering the studies that recommend using technology-based methods and visual evaluation together. White enamel lesions can be either noncarious or carious. Hypomineralization lesions are usually limited to a few teeth (typically, anterior teeth) or generalized throughout the dentition, covering the entire tooth surfaces and have smooth, shiny appearance; WSLs are associated with plaque accumulation and appear rough, opaque, and porous. To avoid confusion, we chose WSLs from patient whose fixed orthodontic treatment was over recently. Minimally invasive approaches, which aim to preserve the maximum amount of healthy tooth tissues, have become important for treating WSLs on teeth and improving the esthetics as part of preventive dentistry. These approaches are easily tolerated by patients and are preferred to restorative treatments. WSLs can naturally remineralize by taking minerals from the saliva without the need for any treatment, but this approach can provide little improvement on the esthetic and structural properties of deeper lesions., Enaia et al. showed that 57.1% of WSLs improved, 26% remained the same, and 16.7% became worse after a 1-year follow-up without any treatment. It is clear that masking the opaque appearance will take a long time during remineralization using spontaneous and low fluoride agents, as lesions can progress and patients can fail to cooperate. Several studies have shown that topical fluoride treatment is effective for remineralizing WSLs and a fluoride varnish is an easy-to-use and reliable method. Fluoride varnishes are thought to be more advantageous as they enable a more controlled fluoride release and require a shorter period for application when compared with traditional methods and fluoride gels., Therefore, we evaluated the effects of 5% NaF varnish on WSLs over 3 months in our study. According to our results, a significant and continual decrease in DIAGNOdent pen measurements was observed during the 3-month follow-up. Therefore, we concluded that fluoride varnish can help decrease WSLs in accordance with other studies. Çehreli stated that high-concentration topical fluoride applications quickly precipitate minerals on the enamel surface and block the superficial pores associated with the underlying surface pores of the demineralized lesion. This hypermineralized layer limits remineralization of the subsurface lesion body, so the lesion clinically preserves its opaque appearance as a deep lesion and cannot always be totally remineralized to change this translucent feature. The decrease in DIAGNOdent pen and visual scores during T2 and T3 control sessions was significant when compared with other groups and can be explained with this point of view. The control period was limited to 3 months and continuous fluoride applications provided better results. A resin infiltrate was used to treat WSLs. A limited number of studies have shown that resin infiltrate provides a better recovery, particularly for deep lesions, as resin infiltrate penetrates deeper with a shorter effect period after treatment compared with treatments using fluoride or casein phosphopeptide–amorphous calcium phosphate remineralization.,, Similarly, this study determined that resin infiltrate, which had favorable effects just after application, was more efficient compared with fluoride varnish according to DIAGNOdent pen and ICDAS scores. These favorable effects were maintained over the 3 months, therefore we concluded that they were sustainable. In accordance with our results, Knosel et al. reported no difference in lesion findings at the end of 6 months and Eckstein et al. found no difference at the end of 12 months. The resin infiltrate technique not only stopped the progress and recovered the WSLs but also penetrated the affected enamel in the developmental opacities.,,, Few studies have evaluated in vivo conditions despite promising short-term reports. Our study concluded that the resin infiltrate enabled a significant decrease in both opaque lesions and DIAGNOdent scores in line with previous studies. The decrease was not high as in WSLs, which received resin infiltrate and the view was partially masked. Munoz et al. reported that resin infiltrate penetrates into active decay lesions when compared with inactive lesions, which is caused by the more porous and thinner surface layer of active lesions. The researchers stated that developmental opacities cannot be totally masked through resin infiltration systems because they have a thicker surface, similar to inactive decay lesions. In our study, a significant decrease in opaque lesions was found after applying the resin infiltrate when compared with WSLs. A significant difference was found between months 1 and 3 of the follow-up. Kim et al. also reported that 1-week measurements of developmental defects that received resin infiltrate were significantly lower than measurements just after infiltration. The reason why resin infiltrate presented a different result for developmental lesions is a subject for future studies. In our study, resin infiltrate application was more successful than fluoride varnish on WSLs. Although fluoride varnish effect on WSLs continued with time, the effect of resin infiltrate was visible just after treating both the developmental enamel opacities and WSLs. We concluded that a long-term continuous fluoride application is required to provide the same effect in WSLs according to resin infiltrate. Treating WSLs with resin infiltrate was a better decision due to shorter term esthetic recovery and high patient satisfaction. DIAGNOdent pen scores decreased and the lesion was partially masked, which enabled promising results as an invasive method after resin infiltrate was applied to treat developmental enamel opacities. The study was supported by Scientific Research Project Unit of Akdeniz University (project no. TDH-2016-1073). Fejerskov O, Kidd E. Dental Caries. The Disease and Its Clinical Management. 2nd ed. Oxford, UK: Blackwell Munksgaard Ltd; 2008. Wallace A, Deery C. Management of opacities in children and adolescents. Dent Update 2015;42:951-4,7-8. Khan M, Fida M. White spot lesions in orthodontic patients part I: Frequency and pattern of distribution. J Khyber Coll Dent 2010;1:20-4. Tufekci E, Dixon JS, Gunsolley JC, Lindauer SJ. Prevalence of white spot lesions during orthodontic treatment with fixed appliances. Angle Orthod 2011;81:206-10. Richter AE, Arruda AO, Peters MC, Sohn W. Incidence of caries lesions among patients treated with comprehensive orthodontics. Am J Orthod Dentofacial Orthop 2011;139:657-64. Ogaard B, Rolla G, Arends J, ten Cate JM. Orthodontic appliances and enamel demineralization. Part 2. Prevention and treatment of lesions. Am J Orthod Dentofacial Orthop 1988;94:123-8. Cochrane NJ, Cai F, Huq NL, Burrow MF, Reynolds EC. New approaches to enhanced remineralization of tooth enamel. J Dent Res 2010;89:1187-97. Al-Khateeb S, Forsberg CM, de Josselin de Jong E, Angmar-Mansson B. A longitudinal laser fluorescence study of white spot lesions in orthodontic patients. Am J Orthod Dentofacial Orthop 1998;113:595-602. Shungin D, Olsson AI, Persson M. Orthodontic treatment-related white spot lesions: A 14-year prospective quantitative follow-up, including bonding material assessment. Am J Orthod Dentofacial Orthop 2010;138:136 e1-8; discussion 7. Willmot DR. White lesions after orthodontic treatment: Does low fluoride make a difference? J Orthod 2004;31:235-42;discussion 02. Bailey DL, Adams GG, Tsao CE, Hyslop A, Escobar K, Manton DJ, et al. Regression of post-orthodontic lesions by a remineralizing cream. J Dent Res 2009;88:1148-53. Malterud MI. Minimally invasive restorative dentistry: A biomimetic approach. Pract Proced Aesthet Dent 2006;18:409-14. Murphy TC, Willmot DR, Rodd HD. Management of postorthodontic demineralized white lesions with microabrasion: A quantitative assessment. Am J Orthod Dentofacial Orthop 2007;131:27-33. Knosel M, Attin R, Becker K, Attin T. External bleaching effect on the color and luminosity of inactive white-spot lesions after fixed orthodontic appliances. Angle Orthod 2007;77:646-52. Knosel M, Eckstein A, Helms HJ. Durability of esthetic improvement following Icon resin infiltration of multibracket-induced white spot lesions compared with no therapy over 6 months: A single-center, split-mouth, randomized clinical trial. Am J Orthod Dentofacial Orthop 2013;144:86-96. Eckstein A, Helms HJ, Knosel M. Camouflage effects following resin infiltration of postorthodontic white-spot lesions in vivo: One-year follow-up. Angle Orthod 2015;85:374-80. Kielbassa AM, Muller J, Gernhardt CR. Closing the gap between oral hygiene and minimally invasive dentistry: A review on the resin infiltration technique of incipient (proximal) enamel lesions. Quintessence Int 2009;40:663-81. Çehreli ZC. Enamel decalcifications due to fixed orthodontic therapy: A mini-review. Turkiye Klinikleri J Pediatr Dent-Special Topics 2015;1:91-4. Crombie F, Manton D, Palamara J, Reynolds E. Resin infiltration of developmentally hypomineralised enamel. Int J Paediatr Dent 2014;24:51-5. 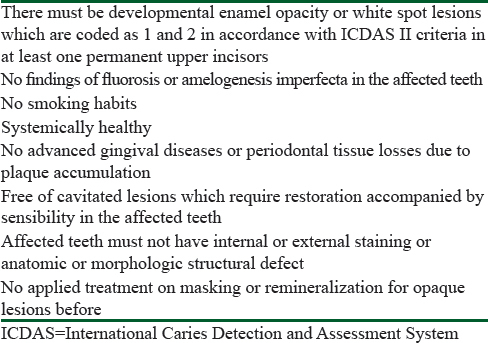 Almosa NA, Lundgren T, Aldrees AM, Birkhed D, Kjellberg H. Diagnosing the severity of buccal caries lesions in governmental and private orthodontic patients at debonding, using the ICDAS-II and the DIAGNOdent Pen. Angle Orthod 2014;84:430-6. Guzman-Armstrong S, Chalmers J, Warren JJ. Ask us. White spot lesions: Prevention and treatment. Am J Orthod Dentofacial Orthop 2010;138:690-6. Enaia M, Bock N, Ruf S. White-spot lesions during multibracket appliance treatment: A challenge for clinical excellence. Am J Orthod Dentofacial Orthop 2011;140:e17-24. Tranaeus S, Al-Khateeb S, Bjorkman S, Twetman S, Angmar-Mansson B. Application of quantitative light-induced fluorescence to monitor incipient lesions in caries-active children. A comparative study of remineralisation by fluoride varnish and professional cleaning. Eur J Oral Sci 2001;109:71-5. Mohd Said SN, Ekambaram M, Yiu CK. Effect of different fluoride varnishes on remineralization of artificial enamel carious lesions. Int J Paediatr Dent 2017;27:163-73. Yuan H, Li J, Chen L, Cheng L, Cannon RD, Mei L. Esthetic comparison of white-spot lesion treatment modalities using spectrometry and fluorescence. Angle Orthod 2014;84:343-9. Zhao X, Gao X. [Effect of resin infiltration treatment on the colour of white spot lesions]. Hua Xi Kou Qiang Yi Xue Za Zhi 2014;32:306-9 [Chinese]. Tirlet G, Chabouis HF, Attal JP. 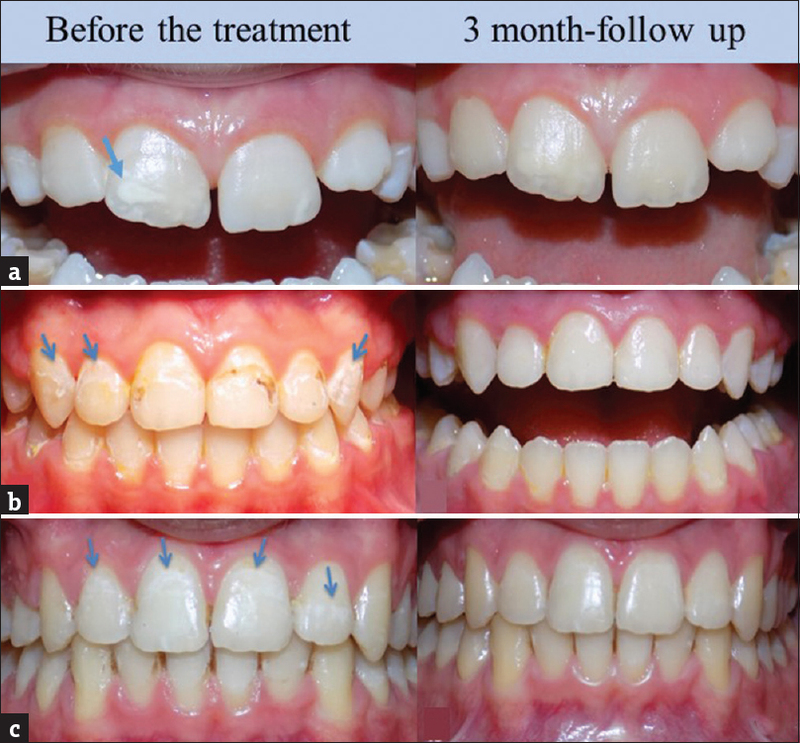 Infiltration, a new therapy for masking enamel white spots: A 19-month follow-up case series. Eur J Esthet Dent 2013;8:180-90. Munoz MA, Arana-Gordillo LA, Gomes GM, Gomes OM, Bombarda NH, Reis A, et al. Alternative esthetic management of fluorosis and hypoplasia stains: Blending effect obtained with resin infiltration techniques. J Esthet Restor Dent 2013;25:32-9.